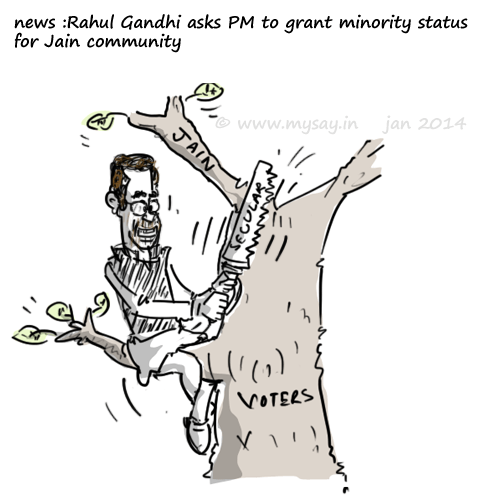 Congress Vice President , Rahul Gandhi has asked the Prime Minister to grant Jain community of India a minority status.After all,this is the age-old politics vote-bank,in the name of secularism. You know what, your presentation may be funny but it depicts the sorry political discourse vis-a-vis the Congress party. Since independence this notorious party is busy dividing the nation for political gain and Rahul Gandhi is just taking forward the rotten legacy. Doesn’t matter to this skunks if the national ethos and fabrics is going to the dogs in the process.